Everybody wants a piece of the North Saskatchewan. Some want to cycle, paddle or run through the river valley. Some want to walk their dogs. Others want to enjoy a coffee, beer or entertainment riverside. How can we have it all? The debate over access and amenities in the river valley has been ongoing for as long as most Edmontonians can remember. But to fully grasp accessibility, it helps to know what’s already there, what’s in the works and what the future holds. There’s a lot to enjoy already—if you know where to go—and more is set to come. 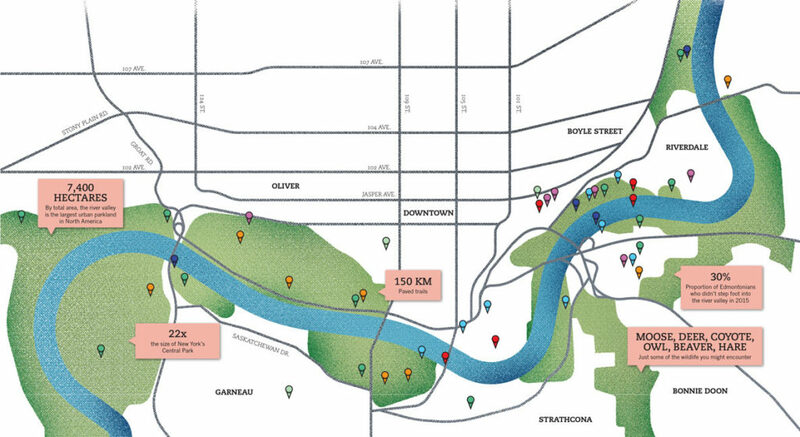 For starters, in the central river valley, the funicular and south LRT will open new portals onto the river valley. Meanwhile, new development is in planning for Dawson Park and Rossdale Flats. From 82 St. on the east to 136 St. on the west, north and south of the river valley topography is changing quickly. By 2025, you might find yourself strolling seamlessly from European promenade into western Canadian wilds within just a kilometre or two along the riverbank. Until then, here are the basic puzzle pieces easily accessible from the core, mapped out to represent the changing physical reality of Edmonton’s most treasured natural asset. There’s a new vision for this dated downtown parkland recognizable by its unique white clay coulee formations and popular bike trails. Final design and construction timelines aren’t known yet, but planning and consultation are underway. By 2020, a new LRT line—with pedestrian crossing—will span the valley, linking to a south side station by Muttart Conservatory. Mechanized Access and “Touch the Water” Promenade. We’re just a year away from a funicular linking the Hotel MacDonald area to the river valley, where the vision is to build a promenade stretching to the new Walterdale Bridge within the next, well, let’s say decade; the City needs more time for funding and development. The final arch was raised this spring and completion is anticipated by 2017. The vision for Rossdale Flats suggests park and public market space, upscale residential and mixed commercial, but construction is still years away.